The Fallout series has embraced weirder and weirder weapons over the years, and this new implement of melodic mayhem from Fallout 76 pushes the envelope even further - all while revealing more about how Bethesda is approaching its new West Virginian setting. 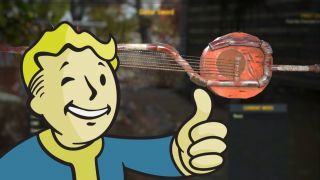 Meet the Guitar Sword, as revealed in a screenshot from the official Fallout 76 Twitter account. It looks more like a Banjo Sword with that round frame to me, but maybe that name would sound a little bit too country bumpkin-y. In any case, it does indeed look halfway between something you'd sit out on your porch playing on a hot summer night and something Cloud Strife would proudly wield in combat. On top of confirming a new weapon, the tweet also strongly indicates the name for the region we'll explore in Fallout 76: Appalachia. After all, we didn't just wander around Massachusetts in Fallout 4, we were residents of the Commonwealth, a region broadly influenced by the American Revolutionary War. Fallout: New Vegas' Mojave Wasteland did something similar by playing up post-apocalyptic Nevada's Old Western sensibilities. Appalachia is the real-life name of a region running along the central and southern Appalachian Mountains, and it makes sense that it wouldn't have a new "Wasteland" name yet; in Fallout 76 only a few decades have passed since the bombs fell. Expect the game to play up the folksy connotations (fair and otherwise) of life in West Virginia along with its Mothman Museum tourist traps and general Americana. I'm not saying there will definitely be super mutants in straw hats, just that there is a strong possibility of super mutants in straw hats. And I bet they'll be pretty handy with those Guitar Swords. Not sure about going post-nuclear online? Check out why Fallout 76 will still be fun if you're an introvert.